Well, it depends. But for interested high school students and folks from the Upper Clark Fork, they’ll soon be able to give you an exact answer. Both meetings start at 5:30 p.m. The meetings will last around 1 ½ hours and will include a brief presentation followed by a trip to a local osprey nest for a field training on collecting observation data. Once recruited, “citizen scientists” are expected to make one trip per week to their assigned nest to collect data over the next 3-4 weeks. The data will be then be provided to the University of Montana for their ongoing research project. Those who sign up to volunteer with the project will be included in the sampling trips in mid-June to mid-July, where osprey chicks will be brought down from the nest, banded for identification and blood sampled for mercury analysis at a lab. Optional involvement includes a trip to the laboratory in Missoula at the UM campus and technical support. Osprey (Pandion haliaetus), or “fish hawks,” are commonly observed near Montana’s lakes, reservoirs and rivers. They are migratory, with the Clark Fork population arriving in April and departing in October for wintering grounds in Central and South America. They are especially important as a “canary in the coalmine” species for determining river health. 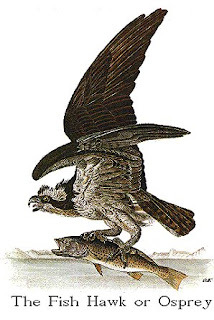 Unlike eagles and other hawks, the diet of the osprey consists entirely of fish, unless it’s absolutely necessary to seek other prey such as small mammals and reptiles. They feed primarily on “rough” fish, such as suckers and whitefish, although trout and other species are consumed regularly. The amount of fish osprey eat is largely determined by whether they are feeding their young and by the distance they must travel from their nesting area to the river or food source, but typically they feed twice per day. Most fish caught by the flying fisherman range in size from 5 to 16 inches, although the osprey can heft fish weighing 4 pounds occasionally. Though very rare, there are instances when an osprey has drowned upon “hooking into” a fish too large to lift, being pulled underneath. As the king of the river food web, they are an excellent indicator of what contaminants are present in the river system. When DDT and other harmful pesticides were legally used, the osprey population was nearly decimated. Their numbers bounced back and now they are being studied with respect to the effects mercury has upon them. Mercury, found primarily in the sediments of streams, accumulate in all species of a river ecosystem. Used heavily in historic gold placer mining operations, mercury is deposited primarily from contamination in the atmosphere. The liquid element, known as “quicksilver,” is a highly toxic substance to the nervous, digestive and reproduction systems of many species, including humans. To learn more about the project, please contact Justin Ringsak, Montana Tech at (406) 496-4897, jringsak@mtech.edu, or Erick Greene, University of Montana, (406) 243-2179. 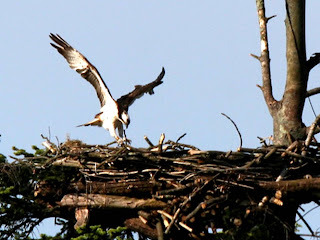 Thank you for this great post about ospreys. As a trout fisherman, they're one of my favorites. Several times I've seen bald eagles take an osprey's fish. It is wonderful to see CFWEP branching out and making all kinds of connections with other groups and place-based learning projects. Keep up the good work. CFWEP rocks! I have a pond that had over two hundred beauitful goldfish in to for over two years. Just this week the osprey discovered it and it is empty in less then one week! I wish I had known of the danger or them. I hear I need to keep an eye on my little kitten also because thay will take them also. I hope that is not true. Ospreys eat fish.....your kitten should be safe.